The 4 1/2 out of 5 star review of Fluid Mask 3 at MacWorld begins by saying that this "Photoshop plug-in takes the pain out of extracting backgrounds," and goes on to recommend the latest version, stating that "Fluid Mask 3.0.2 is a very effective tool for separating objects from their backgrounds. It offers a variety of useful features for tackling almost any difficult image, from wispy hair to complex foliage. Online video tutorials and live training sessions help ease the learning curve." 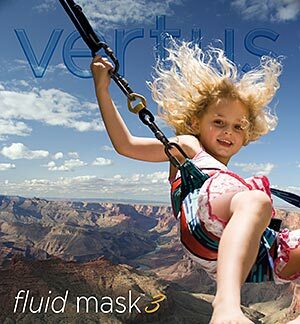 Our friends at Vertus, the makers of Fluid Mask 3 Photoshop Plugin, have set up a special exclusive discount for PhotoshopSupport.com. Just follow this discount link and instantly get $15 off your purchase of Fluid Mask 3. Fastest masking available today - from loading to final cut-out. Turn hours of tedious work into something that's short to complete and fun to do. Quick and easy to pick up, Fluid Mask 3 offers an intuitive workflow. Check out the edge guides that makes selecting the cut-out as easy as coloring by numbers and the always visible interactive help. Amazing edge quality. Fluid Mask 3 takes blending to a new level by preserving the edge data. In the final result, natural edge blur and contour is preserved for the best, most authentic cut-outs ever. Fluid Mask will also work in standalone mode (i.e. not as a plug-in). There is now an XML based Help file which may be searched by sections or by keywords. Also included are video tutorials. Fluid Mask may be used with a Wacom tablet, now pen pressure is hooked up to Brush Size. To learn more visit the Fluid Mask 3 - Discount Deal Page.